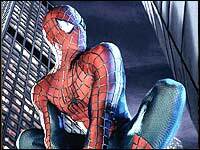 In the hit 2002 film "SPIDER-MAN," a key scene takes place in New York's Times Square - or so it seems. In the scene, news photographer Peter Parker (Tobey McGuire) is covering a "World Unity Festival" in Times Square, and Macy Gray is performing, when the crowd is attacked by the villainous Green Goblin (Willem Dafoe), who has also endangered Mary Jane (Kirsten Dunst). Spidy springs into action, and a battle between the wallcrawler and the Green Goblin ensues. Some of the broader shots were taken in the actual Times Square, but most of the "World Unity Festival" scenes were actually shot on a huge replica of Times Square, an open-air set constructed right here in the L.A. area. The location was the old Rockwell/Boeing/NASA Defense plant, at Bellflower & Imperial Highway, in Downey, CA, a 160-acre property with a long history. It was here, in real life, where the Apollo command & service module was built (for the mission to the moon), and where the Space Shuttle components were constructed. The now-empty parcel is bordered by Bellflower Blvd on the east, Lakewood Blvd on the west, Imperial Highway on the south and Stewart & Gray Road on the north. The city of Downey is located to the east of Los Angeles, and about four miles north of the city of Lakewood. Some of the scenes in the 2002 movie "Clockstoppers" were also shot on the same Boeing property. worked in a restaurant called "The Red Car Diner". the water at 4211 Admiralty Way, in Marina Del Rey, CA. Update: in 2008, the restaurant was renamed "The Organic Panificio Restaurant & Cafe".